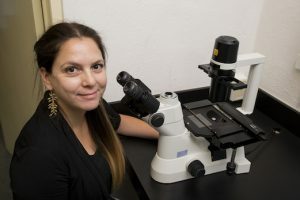 MIAMI, Fla. – Romina Gazis, a newly hired Plant Pathologist at The University of Florida Institute of Food and Agricultural Sciences at the Tropical Research and Education Center located in Miami-Dade County, has been invited to speak at the First State of the World’s Fungi Symposium to take place at the renown Kew Gardens September 13 &14 in England. Kew Gardens is a global leader in fungal science. “I am honored to have been invited to speak and share my research with such a prominent group of speakers,” said Gazis when asked about her participation at the first State of the World’s Fungi Symposium. The relevance of this symposium is that it will synthesize the world’s state of knowledge on Fungi from several aspects: conservation, evolutionary biology, diversity, and their impact on society including agriculture,” said Gazis. She will be part of the session “Do fungi provide a greater ecosystem service or disservice?” being the title of her presentation: Tropical agriculture: a never-ending battle against fungal pathogens, an area that she believes of great importance due to the location of her research program, South Florida. Environmental conditions in South Florida allow rapid plant growth year-round but are also conducive to fungal establishment, infection, growth, persistence, and spread. In addition, South Florida has several ports of entry which represent major hubs for importing plants from around the globe. Suitable conditions for fungal establishment and a constant influx of fungal infected material increase the likelihood of introductions of noxious invasive species that can have devastating consequences to the local green industry. Therefore, disease pressure represents a major limiting factor to increasing profit margins as the steps taken to ensure marketable crops usually require costly measurements. The nursery and landscape industry is one of the most important industries in South Florida, with an estimated total sales output surpassing $8 billion and the support of more than 70,000 jobs. Economic losses due to fungal diseases represent one of the most important limiting factors nor only for this industry but for the tropical fruit and vegetable industries as well. In her talk, Gazis will cover the biology and economic impact of devastating fungal diseases like the one currently affecting the avocado industry (Laurel wilt – $27- $54 million-dollar losses so far), landscape palms (Fusarium wilt), among others. Gazis has extensive experience in fungal biology and her recent appointment at the Tropical Research and Education Center as the Plant Diagnostic Clinic Director keeps her constantly diagnosing for close to 1000 samples annually through the clinic. “Since coming on board, Dr. Gazis has brought the Plant Diagnostic Clinic to a new level, as she is offering the industry innovative methods of diagnosis that we were not offering before and the agricultural industry was very much in need of her expertise,” said director Edward “Gilly” Evans of TREC. 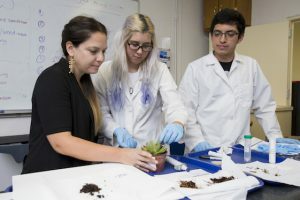 The University of Florida Institute of Food and Agricultural Sciences, Tropical Research and Education Center’s vision is to be the world leader in the provision of new innovative scientific discoveries and practices for the sustainability of tropical and subtropical agriculture and natural resources.